Awesome Pineapple Jerk Tofu Recipe - Oh My Veggies! I don’t know about you, but nothing says autumn to me like a good pineapple recipe! Alright, maybe not, but living in North Carolina, it’s not like pineapple is ever an ingredient that’s in season here. While I do my best to eat local, there are some things that I’m just not willing to go without, like pineapple and bananas. Lately I’ve been very into adapting meat recipes into meatless ones–it’s a good way to mix things up a little bit. This recipe is an adaptation of a pork chop recipe I found in Everyday Food. Back in Madison, there was a restaurant that sold amazing jerk tofu, so as soon as I saw this recipe, I knew I’d try to make it with tofu instead. I had tried making jerk tofu on my own before and it just never wowed me–when I used pre-made jerk mixes, it always ended up being far too spicy, losing all the other flavors in the process, and when I tried making my own jerk seasoning, it wasn’t quite right either. 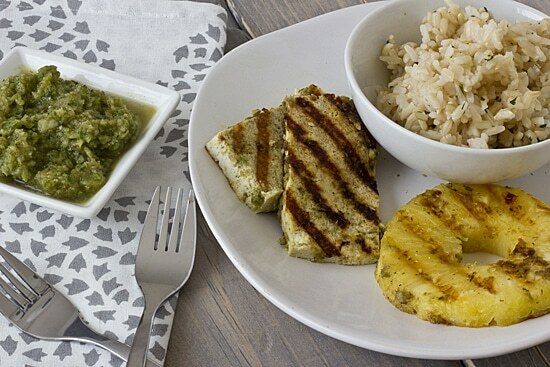 A jerk tofu recipe adapted from Everyday Food's Pineapple Jerk Pork Chops. Cut four 1/4 inch thick rounds from pineapple; set aside. Cut remaining pineapple into large chunks. In a food processor, combine pineapple chunks, scallions, chile, thyme, garlic, allspice, and olive oil and pulse until almost smooth. Heat grill to medium-high and brush or spray with olive oil. Brush excess marinade from tofu and pineapple and place on grill. Cook approximately 8 minutes (or until lightly browned), turn, and cook the other side for approximately 8 minutes more. Serve with leftover marinade. Um, yes please!! This looks amazing. I love grilled fruit. Oh I love grilled pineapple and this just looks so delicious!! I love pineapple and don’t have enough recipes with it. This will be a great addition to my repertoire. Oh my word, looks and sounds HEAVENLY! I will try it out! Is pineapple in season in fall? I always think about pineapple as a summery fruit. This sounds delish! I think it’s one of those things that’s kind of in season all year because it always gets imported from somewhere else? Oh, that looks really good. I haven’t had tofu in years! For a vegetarian, I really don’t eat too much of it. I’m not crazy about it–it needs to be prepared just right. Oh wow…that looks so good! I’m going to have to try it! Let me know if you do! I think the pineapple jerk marinade would be good on a lot of different things. Wow! This looks great. I never know what to do with tofu. This recipe is making my weekly meal plan for the week. Thanks!! Thank you! I’m not a big tofu fan, but I find that whatever I do with it, if I freeze it first, I like it more. Somehow it changes the texture and I feel like the flavors get absorbed better. I’m going to try this, but with broccoli, too. There’s not much in season right now fruit-wise, so I’m straying into the non-local stuff. I need to get more creative with my tofu marinades. I’ll post again after I make this, thanks for the recipe! Yes, I always try to eat local too, but this time of year is difficult. I’ve been stretching my definition of “local” to encompass Florida. 🙂 I hope you like the recipe! Got around to making this tonight and loved it! How can I rate the recipe? It needs five stars. Didn’t marinate the tofu for long and used quinoa instead of rice, both to save time. It turned out just great even so, loved the mix of flavors with the thyme, allspice, jalapeno, and pineapple. Thanks!